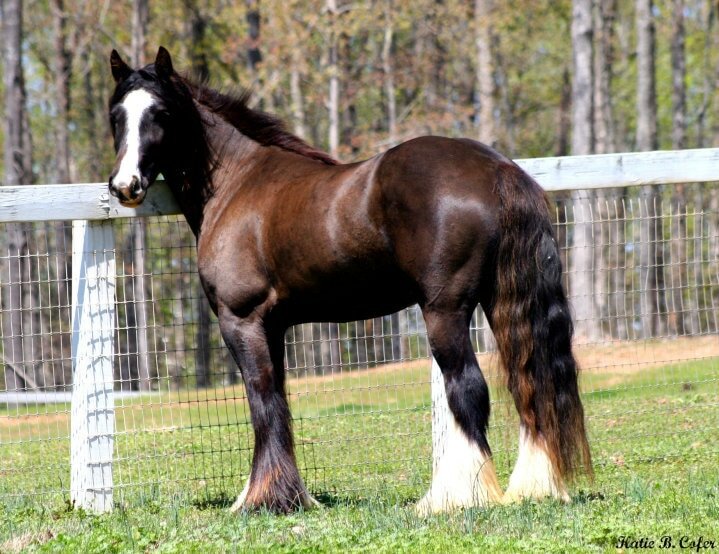 ​Baksheesh is a quality Gypsy Vanner with great movement, temperment and her Bloodlines are outstanding!! Bak has a wonderful disposition just a love in the stall. She is very loving easy to work with! Bak is very strong in her movements and is put together so nice! Gorgeous long hair, beautiful feathering and long forelock she will turn heads!! And LOOK at her bloodlines not only is her sire Tonka, her maternal grandsire is Lenny's Stallion and her fraternal grandsire it The Lottery. Two of the most famous stallions in the UK. We have full dna on her on both sides. Baksheesh means "Good Fortune" in Romany. There are only a few Tonka UK offspring in the U.S. Bak's sire Tonka UK sadly passed away in 2010. Bak is the only solid offspring in the US. We love working with Bak she is gifted in her movement and has so much talent. She is a perfect height standing at 14.2 hands.